Over the past 10 years Brady Earnhart has built a reputation as a songwriter's songwriter up and down the East Coast. His moving, literate, and often humorous songs have been compared to those of Paul Simon, Lyle Lovett, and Greg Brown. Acoustic Guitar magazine's Elizabeth Papapetrou calls his 1998 debut After You "one of the ten best contemporary folk CD's of the 1990s." Cville Weekly music critic Keith Morris calls Brady's new work Manalapan "a fully realized, mature album . . . the most subtly poetic, skillfully crafted and all-inclusively human stuff I've heard in years." Named for a tiny south Florida snorkelers' destination, Manalapan extends the emotional landscape of the earlier album with a new series of character-driven stories set off by innovative arrangements of strings, horns, and guitars. Manalapan was recorded at Jeff Romano's studio in Greenwood, VA, with serious help from Carter Blough (bass), Eric Stassen (percussion), Bobby Read (saxophone), Kris Curran (french horn), Gina Pezzoli & Ted Stewart (cello), Joe Lawlor (electric guitar), and background vocalists Paul Curreri, Jeff Romano, Danny Schmidt, Jan Smith, & Joia Wood. Jeff & Brady mixed the tracks, which were mastered by Dave Glasser at Airshow. 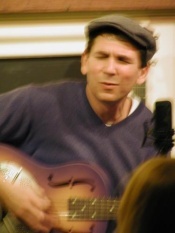 Brady's song "Gargoyle" won the gold medal in the folk category of the 2002 Mid-Atlantic Songwriting Contest and appears on Charlottesville radio station WNRN's Station Break. Acoustic duo Nickeltown's cover of "After You" is included in NPR station WMRA's compilation CD In the Shadow of the Blue Ridge. ("Get Right Back" and "Arlington" from the new CD are due out soon on sequels to these collections.) In June 2002, "Car Repair" aired on NPR's CarTalk. Three Earnhart performances appear on King of My Living Room, a live singer-songwriter showcase released in 2001. A proud new member of the City Salvage Records label (along with Paul Curreri, Andy Friedman, and Devon Sproule), Brady is a 2002 Mountain Stage New Song Festival finalist and has performed at such venues as Starr Hill, Acoustic Charlottesville, Acoustic Muse, the Shenandoah Coffeehouse Series, and the Florida Folk Festival, as well as pubs, bookstores, and coffeehouses throughout the eastern U.S.
After receiving an MFA in Poetry from the University of Iowa, Brady began writing songs seriously in 1989. In 1992 he went back to school once again and got a PhD in English Literature at the University of Virginia in Charlottesville. While he was there, he caught the attention of several local singer-songwriters. Two of them, Browning Porter and Jeff Romano of Nickeltown ended up performing and recording some of his songs (check out "Tide by Tide" and "After You" on their CD Presto Change-O). Jeff ended up engineering and co-producing both of Brady's CDs . Brady has taught creative writing to elementary school students, English as a Second Language in Spain, and (currently) American literature and creative writing at the University of Mary Washington in Fredericksburg, VA.